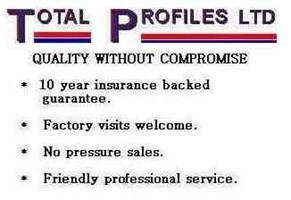 Total Profiles Ltd - Windows/Doors/Conservatories based in Bordon, Hampshire. Invoice history based on 523 reviews. We have been trading continuously for over 31 YEARS and offer a friendly, no obligation, no pressure quotation service. We are installers of 'A' rated glass. We specialise in Bespoke Window and Door Replacements that are sympathetic to your property as well as being Building Regulations Compliant. All of our staff are committed to manufacturing and installing the finest products and not buying in which has become the industry trend. Factory visits are always welcome and encouraged. All Conservatory quotations have a detailed check list so nothing can be overlooked or forgotten. A detailed drawing is also supplied, and all important planning advice is also available. We are proud to announce that we are licensed by The British Fenestration Rating Council to manufacture "A" rated windows. "A" rating means MONEY SAVING ON YOUR HEATING BILLS. True quality without compromise. Please support local business employing local people. GU Postcodes, But other areas considered.